Tolle Lege - Take Up and Read! 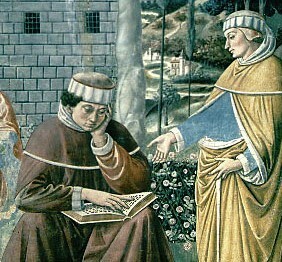 St. Augustine (354-430) was one of the great figures of the early Church. The story of his conversion to Christ is told in his Confessions, in which he describes how God used a single verse from the epistle to the Romans to suddenly convert him. He went on to serve the Church as an illustrious teacher and bishop in the African city of Hippo. But when a profound reflection had, from the secret depths of my soul, drawn together and heaped up all my misery before the sight of my heart, there arose a mighty storm, accompanied by as mighty a shower of tears. Which, that I might pour forth fully, with its natural expressions, I stole away from Alypius; for it suggested itself to me that solitude was fitter for the business of weeping. So I retired to such a distance that even his presence could not be oppressive to me. Thus was it with me at that time, and he perceived it; for something, I believe, I had spoken, wherein the sound of my voice appeared choked with weeping, and in that state had I risen up. He then remained where we had been sitting, most completely astonished. I flung myself down, how, I know not, under a certain fig-tree, giving free course to my tears, and the streams of mine eyes gushed out, an acceptable sacrifice unto Thee. And, not indeed in these words, yet to this effect, spake I much unto Thee, - "But Thou, O Lord, how long?" How long, Lord? Wilt Thou be angry for ever? Oh, remember not against us former iniquities;" for I felt that I was enthralled by them. I sent up these sorrowful cries, - "How long, how long? Tomorrow, and tomorrow? Why not now? Why is there not this hour an end to my uncleanness?" I was saying these things and weeping in the most bitter contrition of my heart, when, lo, I heard the voice as of a boy or girl, I know not which, coming from a neighbouring house, chanting, and oft repeating, "Take up and read; take up and read." Immediately my countenance was changed, and I began most earnestly to consider whether it was usual for children in any kind of game to sing such words; nor could I remember ever to have heard the like. So, restraining the torrent of my tears, I rose up, interpreting it no other way than as a command to me from Heaven to open the book, and to read the first chapter I should light upon. 2 For I had heard of Antony, that, accidentally coming in whilst the gospel was being read, he received the admonition as if what was read were addressed to him, "Go and sell that thou hast, and give to the poor, and thou shalt have treasure in heaven; and come and follow me." And by such oracle was he forthwith converted unto Thee. So quickly I returned to the place where Alypius was sitting; for there had I put down the volume of the apostles, when I rose thence. I grasped, opened, and in silence read that paragraph on which my eyes first fell, - "Not in rioting and drunkenness, not in chambering and wantonness, not in strife and envying; but put ye on the Lord Jesus Christ, and make not provision for the flesh, to fulfil the lusts thereof." No further would I read, nor did I need; for instantly, as the sentence ended, - by a light, as it were, of security infused into my heart, - all the gloom of doubt vanished away. Closing the book, then, and putting either my finger between, or some other mark, I now with a tranquil countenance made it known to Alypius. And he thus disclosed to me what was wrought in him, which I knew not. He asked to look at what I had read. I showed him; and he looked even further than I had read, and I knew not what followed. This it was, verily, "Him that is weak in the faith, receive ye;" which he applied to himself, and discovered to me. By this admonition was he strengthened; and by a good resolution and purpose, very much in accord with his character (wherein, for the better, he was always far different from me), without any restless delay he joined me. Thence we go in to my mother. We make it known to her, - she rejoiceth. We relate how it came to pass, - she leapeth for joy, and triumpheth, and blesseth Thee, who art "able to do exceeding abundantly above all that we ask or think;" for she perceived Thee to have given her more for me than she used to ask by her pitiful and most doleful groanings. For Thou didst so convert me unto Thyself, that I sought neither a wife, nor any other of this world's hopes, - standing in that rule of faith in which Thou, so many years before, had showed me unto her in a vision. And thou didst turn her grief into a gladness, much more plentiful than she had desired, and much dearer and chaster than she used to crave, by having grandchildren of my body. 2. On this practice of consulting the Bible randomly, see Pieter W. van der Horst, "Ancient Jewish Bibliomancy," Journal of Greco-Roman Christianity and Judaism 1 (2000). See also Van der Horst's "Sortes: Sacred Books as Instant Oracles in Late Antiquity," in L.V. Rutgers, P.W. van der Horst, H.W. Havelaar, L. Teugels (eds. ), The Use of Sacred Books in the Ancient World (Contributions to Biblical Exegesis and Theology 22), Leuven: Peeters, 1998, 143-174.